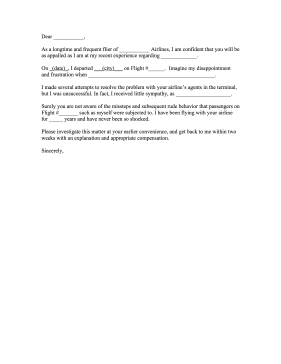 This airline complaint letter allows the user to fill in the blanks with relevant information. As a longtime and frequent flier of ___________ Airlines, I am confident that you will be as appalled as I am at my recent experience regarding _____________. On _(date)_, I departed ___(city)___ on Flight #______. Imagine my disappointment and frustration when ______________________________________________. I made several attempts to resolve the problem with your airline's agents in the terminal, but I was unsuccessful. In fact, I received little sympathy, as ____________________. Surely you are not aware of the missteps and subsequent rude behavior that passengers on Flight #_______ such as myself were subjected to. I have been flying with your airline for _____ years and have never been so shocked. Please investigate this matter at your earlier convenience, and get back to me within two weeks with an explanation and appropriate compensation.